Following the BRICS Summit in Xiamen, East China's Fujian Province, the question is how to build the second golden decade of the bloc. The BRICS (Brazil, Russia, India, China and South Africa) have expanded their "friends" circle with the "BRICS plus" mechanism so that a new cooperation partnership model with other developing countries can be built. The bloc has entered a new "three-wheel driven" stage that involves economic cooperation, political trust and people-to-people exchanges. Looking ahead to the next decade, the BRICS countries, as an emerging international actor representing emerging and developing countries, will need to participate in global governance on the international stage with new cooperation structures and concepts. The countries will also need to strengthen their coordination so that they can effectively respond to their domestic challenges involving the economy and society. In this situation, both internal and external high-quality governance is needed. First, from the perspective of global governance, the BRICS countries play an increasingly important role in participating in and promoting the reform and restructuring of the global economic governance system. In the next decade, this initiative should be continuously pursued and its positive influence should be further spread. In recent years, there have been adjustments to the world economy and global economic governance system. The BRICS have contributed to the improvement of global economic governance and the construction of international financial security through the establishment of the New Development Bank and the BRICS Contingent Reserve Arrangement. This year, the BRICS Leaders' Xiamen Declaration adopted a number of concrete measures to promote reform of the global governance system, such as strengthening cooperation among the World Bank, the Asian Infrastructure Investment Bank and the commerce departments of the BRICS countries and improving the global tax system. Since the BRICS evolved from a Wall Street concept into a diplomatic framework, their economic cooperation and participation in global economic governance has naturally become a priority for them. But the BRICS are increasingly the object of high hopes among the vast number of other developing countries, which hope the bloc can be more involved in global problem solving and creating checks and balances in terms of power politics. China and Russia are permanent members of the UN Security Council. If the five countries (and if necessary, their dialogue partners) speak to issues related to international peace, security and development, that will be in line with the expectations of the international community. It will also contribute to the common interests of the BRICS themselves as well as other developing countries. Finally, it will help the BRICS set the international affairs agenda, including rule-making authority and the right to join international discourse. Second, the BRICS must pay attention to their internal cohesiveness - that is, the governance of economic and social issues in and among the BRICS countries. The Sino-Indian Doklam border confrontation before the Xiamen summit chilled relations between China and India, and it raised many worries about the participation of India in the Xiamen summit. The unconditional withdrawal of India from the Doklam area erased the worries, but the incident demonstrated that to construct a peace and security dialogue among the BRICS countries is very important and urgent. In addition, because the economic structures and development trends of the BRICS countries are very similar, it is inevitable that there will be economic competition and even conflicts. Therefore, it is necessary to establish an arbitration mechanism to resolve such conflicts. International skepticism about the BRICS' prospects mainly reflects the slow economic growth, high unemployment rates and severe inflation of Russia, Brazil and South Africa. The economic downturn has also led to an increase in social problems like strikes and crime. The BRICS need to face these internal challenges and pursue structural economic reforms such as improving their infrastructure, supporting independent innovation and promoting the business environment to boost economic diversification. 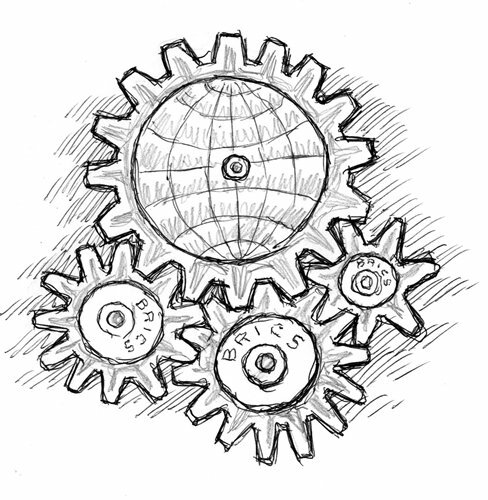 The future of the BRICS depends on making these internal and external adjustments.